To see my Taylored Expressions Blast from the Past Blog Hop please SCROLL DOWN. Thanks! I love this adorable little crab! So cute! 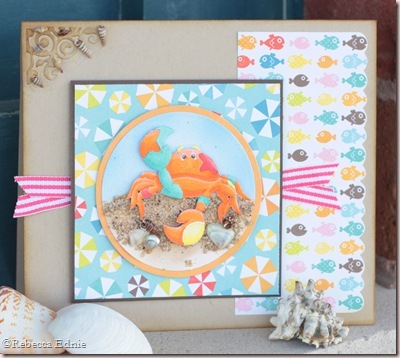 And I just love making beach themed cards. If you read my blog regularly, you might remember I had some trouble with my Mudd Puddles sand and shells drying out. I am happy to report that the water I added worked quite well and they were all back to normal consistency when I took them out yesterday. 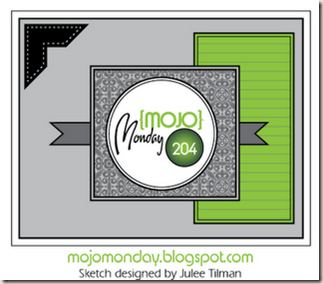 I used this Monday’s Mojo sketch for this card. Click on the image to link to the blog. I tried out a new technique on this card. A few of the Copic designers have been showing a technique taught at the Intermediate class (which I am dying to take, the closest is Ottawa, a 5 hour drive and it’s after school starts, BUMMER) which involves cooling off the deepest areas of shadows with a BV marker. While it is hard to see due to the size of the photo (click to see it larger), it really worked and quite well. I was amazed! I had tried it before but didn’t like it because I assumed if I was shading over a marker ending in a certain number, I should shade with a BV ending in the same number, not so! Way too dark and obviously purplish. Debbie Olson was using a BV000 or 00 over much deeper colours and that’s what I tried. YEAH! The background was airbrushed though you can’t see the shadows I added underneath the crab because of the sand. I do love the look of the airbrushing beneath the sand! I hand cut the scalloped edge around the fishies. I embellished the embossed corner with shells. OK, so I have a confession to make, I cut apart the embossing folder I used as it has 2 corners making up a square shape. I didn’t think about it but the shape of the cut area also embossed! Maybe I didn’t need the shim? Ooops! So I had some errant embossing to cover up so that’s why I added the shells. Paper: DP-Splash-Echo park, kraft, espresso CS-SU! Well this is fantastic Rebecca! I love the sand and little shells you added. Your coloring is amazing and I'll have to look up that shadowing technique because it's terrific on this card. So cute. How cool is that! Love the sand and that crab is so cute. Beautifully done! Love the sand, and the airbrushing, and goodness, it's so happy! Hugs…! Wow, super cute card, great paper and love the added details. Delightful card! Very cute, I love your crab card! Wow! You really did a phenomenal job on this. Love the wonderful techniques and neat touches. The sand looks incredible. fabulous card! I just bought that paper pack…I'll have to pair it with the crab too! This is so uber cute! Your coloring and colors are Fabulous and I love love love the sand and seashells. So Cute! I love the colors, and that crab is fantastic! Great job! What a happy, colorful card! I just love it. The paper with the fish fit perfectly into the scallop punch! It was absolutely made for it. You made me smile big time! Thanks, Joan!!! How cute! The ribbon is great and the fishy paper put a smile on my face.